*Updated 4-20-16 to reflect newest version of Fox 2.5 Factory Series Shocks. 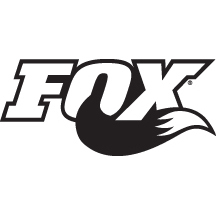 In 2014 Fox introduced the 2.5 Performance Series line of coilovers to their offroad division in order to better compete with lower cost King and Sway-A-Way shocks. 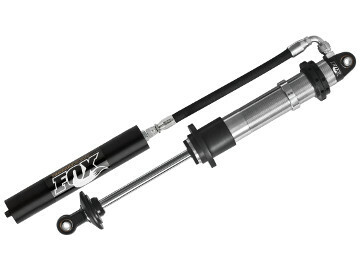 Fox 2.5 Performance Series Coilover shocks use industry standard components to deliver a lower price point than the Fox 2.5 Factory Race Series coilover shocks. Now included in this article is a review of of recent upgrades to the Fox Factory Series coilovers. Friction is one of the most important elements in a shock, it causes harshness and reduces damping control. The effects of friction are most significant on lightly sprung vehicles because friction is a larger portion of the damping. In 2016 both Performance Series and Factory Series Fox 2.5 Coilovers received upgrades to reduce friction and increase dampening consistency. 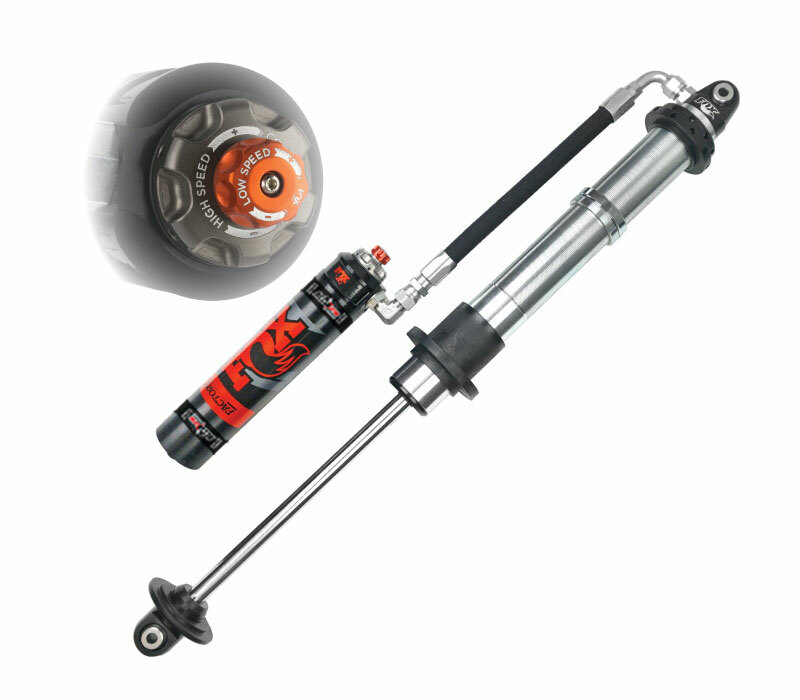 Both shocks now report 18 lb (+/- 3 lb) of friction, which is good for a large bore off-road shock. Furthermore, the friction appears to be stable across a range of gas pressures (tested up to 300 psi) which will result in more consistent performance. 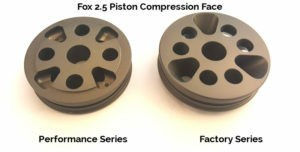 In 2015 both the Fox Performance Series and Factory Series 2.5 Fox coilovers received new pistons. The Fox 2.5 Factory Series piston is a high flow race design with 3D CNC porting to eek out every bit of ride quality, while the Performance Series is an industry standard, low flow piston designed with manufacturing in mind. For $50 we can upgrade the 2.5 Performance Series shocks to use the 2.5 Factory Race Series piston. Both have 2 x .098″ bleed holes from the factory, although we can install one or three bleed pistons as necessary. The new Fox 2.5 Performance Series coilovers have much smaller compression ports which greatly reduce the flow and increase load. The changes in compression damping are very dramatic and may require some unique valving tricks on light vehicles with 1:1 motion ratio to avoid harshness on compression. Luckily for you we know all the tricks necessary to make these perform. 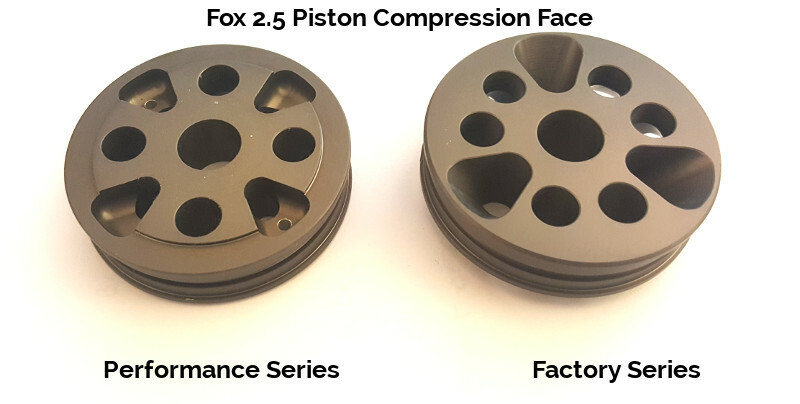 The new Fox 2.5 Factory Series coilover pistons use a high flow design with 3d CNC ported inlets which reduce harshness and improve the ability to fine tune the shock. The Fox 2.5 Performance Series coilover piston features small round rebound ports which can require tuning tricks on lightly sprung vehicles. The new 2.5 Fox Factory Race Series coilover pistons have larger round rebound ports which have further improved tuning capability on lightly sprung vehicles. Both pistons should perform well on heavily sprung applications. Both Performance Series and Factory Race Series Fox 2.5 Coilover Shocks use a new upgraded wear band with o-ring preloader. 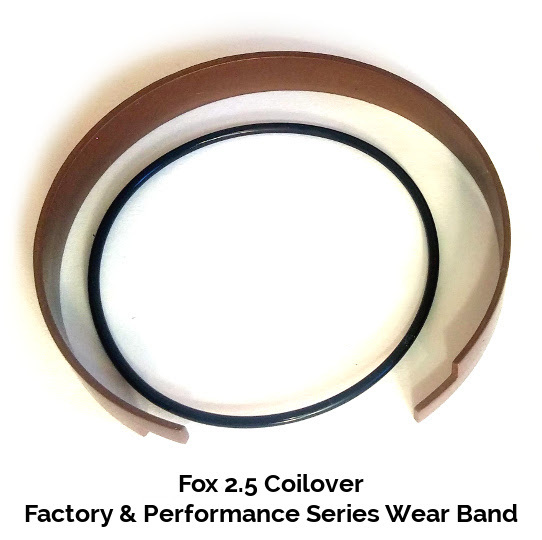 The new wear band uses a lower friction, less abrasive, and more durable material which is coupled with an o-ring to improve damping consistency. Over time wear bands loose material which ends up in the oil, reducing dampening consistency and leading to increased wear, the new wear band is a great improvement on each of these characteristics. The pre-load o-ring also increases consistency by reducing oil blow-by around the piston. The new wear band is a big improvement and a great upgrade to both shocks. There are some substantial durability differences between the Performance Series and Factory Race Series Fox 2.5 Coilovers. Piston rods are one of the most important parts of a shock in terms of durability. Damaged rods from flying debris are the leading cause of leaking shocks, having a harder and stronger piston rod reduces the likely hood of a leaky shock. 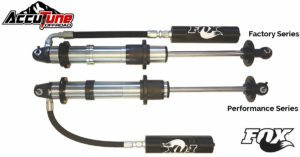 Factory Series shocks use a 17-4 H900 stainless steel piston rod that is extremely strong, resistant to flying debris and corrosion resistant. 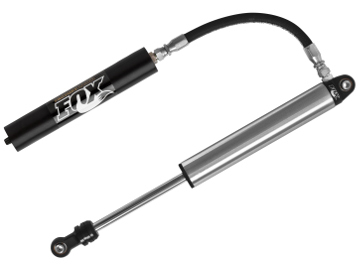 The Fox 2.5 Factory Series coilover piston rod is the best in the off-road industry. 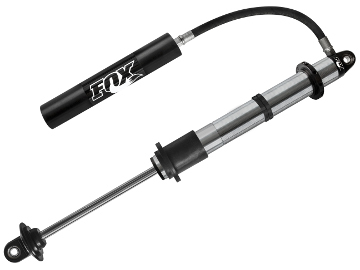 Fox 2.5 Performance Series coilover shocks use a high carbon steel piston rod that is likely 1040-1060 case hardened steel. High carbon steel rods are standard in the industry and are similar to King Performance Series shocks. Below you can see that the Factory Series piston rod has twice the resistance to flying debris (HRc) and is almost twice the strength. Fox Performance Series coilovers inherited a urethane wiper and Buna main seal from the original blue Fox 2.5 coilovers. 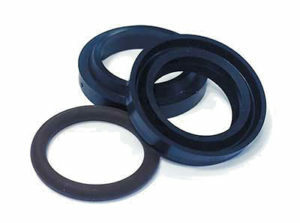 The main seal in Fox Factory Series shocks have been upgraded to Viton. Viton is known for its superior durability and heat tolerance. After many cycles at high temperature Buna can get hard making it more susceptible to leaking. It is hard to speculate on the exact temperature range for the Fox seals but common Buna is rated for 225 F while common Viton is rated for 350 F.
Fox 2.5 Factory Series & Performance Series shocks both use the same JM92 oil and the same valve disks on compression and rebound. Both Factory Series and Performance Series 2.5 Fox coilovers use COM-10T (5/8″ ID) bearings and both come with spacers to fit a 1/2″ bolt at 1.50″ wide. Fox 2.5 Factory Series spacers are made from 304 SS while Performance Series spacers are zinc plated steel. Both spacers have o-rings to control rotation, simply remove the o-rings to gain full misalignment. 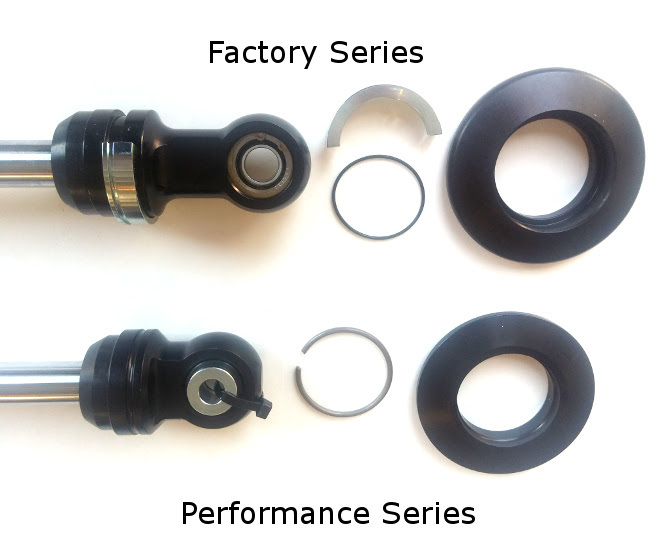 Fox Factory Series dual rate coilover nuts are made from steel, and Fox Performance Series dual rate coilover nuts are made from aluminum, both use the same dual rate slider. No functional differences have been noticed between the two. In 2016 the Factory Series shocks were upgraded to use the new Aluminum reservoirs. The new reservoirs are lighter and feature redesigned internal parts which improve dampening consistency. 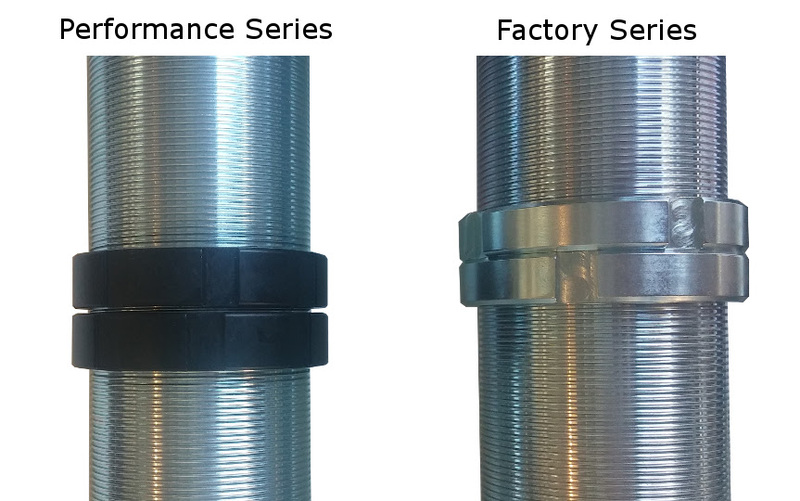 The Factory Series shocks use a high quality -10 braided hose with re-useable style aerospace fittings while Performance Series shocks are made with industry standard -8 crimp fittings and rubber hose. Fox 2.5 Factory Series coilovers use a long rod end which fits well into trailing arms and keeps the spring perch out of harms way. Fox 2.5 Performance Series coilovers use a shorter rod end and may require careful fitment inside of deep trailing arms. The longer Factory Series rod end also explains some of the length difference between the two shocks. Factory Series 2.5 Fox coilovers use a clam shell design to hold the spring force while the Performance Series 2.5 Fox coilovers use a snap-ring. The snap ring used is very heavy and prone to scratching the rod end. 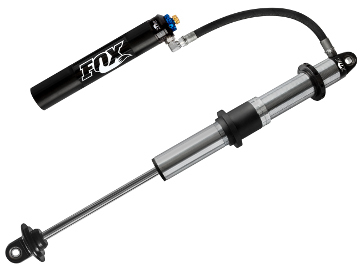 Fox 2.5 Factory Series coilovers are available with a 1″ shorter rod end, which makes the shocks nearly identical in length. Fox 2.5 Performance Series coilovers use industry standard parts, and a lower performance piston to deliver exceptional value for recreational users. Extreme off-roaders, racers and anyone with in corrosive environments should use the Fox 2.5 Factory Series coilovers.